Staff at an Oxfordshire care home have been accused of abusing residents. 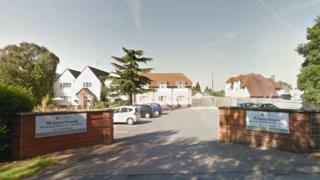 Thames Valley Police said it has received reports of assaults and ill treatment by staff at Winterbrook Nursing Home in Wallingford. Officers attended the site on 23 June, but so far no arrests have been made. The Care Quality Commission (CQC) put the home into special measures after concerns about abuse were raised with the local authority safeguarding team. A Thames Valley Police spokeswoman said: "Officers are currently investigating common assault offences and ill treatment by care provider and ill treatment by care workers." CQC inspectors visited on 20 July and identified "potential concerns about people's safety" at the home, which can house up to 41 people. The CQC said in its report: "A culture that did not treat people with dignity and respect had developed and people were not always treated in a kind and caring manner. "People were not always protected from abuse and improper treatment and were not confident to raise concerns." It added that medicines were not always managed safely and people were not protected from the risk of infection. Paul Kelly, operations director at the nursing home, said they "apologise unreservedly to everyone connected with Winterbrook, in particular residents and their families". He added: "We were outraged and saddened by the examples of abuse brought to our attention. "All members of staff associated in any way with this behaviour towards residents were either dismissed or resigned as soon as we were notified of the behaviour. "We have drawn up a detailed, comprehensive and robust action plan to resolve all inadequacies and we are updating the CQC on a weekly basis."